Refugees do not show up in the Mediterranean Sea as if from nowhere. By the time they get into their flimsy boats on the Libyan coastline, they have lived many, many dangerous lives. They would have left their increasingly unproductive fields in western and eastern Africa, fled wars in the Horn of Africa, in Sudan and in places as far as Afghanistan, and traveled great distances to get to what they see as the final leg of their journey. What they want is to make it to Europe, which since the early days of colonialism has broadcast itself as the land of milk and honey. Old colonial ideas and the wealth of Europe built from colonial labour beckons. It is a siren for the wretched of the earth. 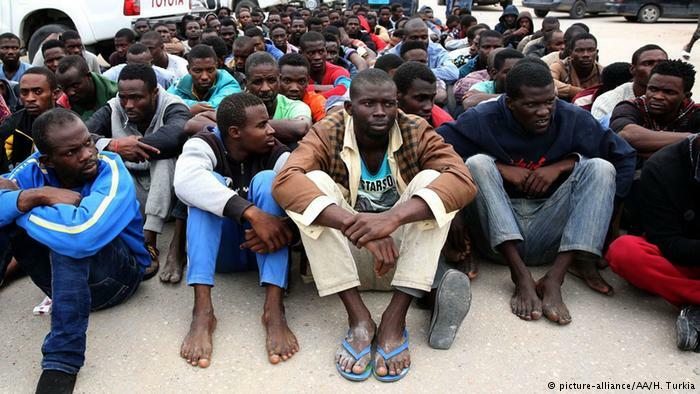 It has ended for many Africans in virtual concentration camps in Libya, where refugees that Europe does not want now linger — some sold into slavery. To get to Libya, the migrants and refugees have to cross the Sahara Desert, which in Arabic is known, rightly, as the Greatest Desert (al-Sahara al-Kubra). It is vast, hot and dangerous. Old salt caravans — the Azalai — mostly managed by the Tuareg peoples would run between Mali as well as Niger and Libya. They would carry gold, salt, weapons and captured human beings as objects of trade. Those old caravans still make their journey, moving from one water source to the next, the camels as exhausted as the Tuareg. Newer caravans have supplanted these older ones. Camels are not their mode of transport. They prefer buses, pickup trucks and jeeps to ferry humans and cocaine towards Europe, while guns and money comes southwards. These newer caravans drive along unmarked paths, heading between sand dunes, searching for old tire tracks that have been buried in disorienting sandstorms. The Sahara is dangerous. The journey in a pickup truck could take three days, at best, or the refugees and cocaine mules could find themselves dying from dehydration, extremists, smugglers or the security forces in the region. There are many people ready to prey on the travellers and on the smugglers, whose cars are routinely stolen. No proper account exists of dead refugees. This June, the UN Refugees Agency reported the death of 44 migrants who died of dehydration and heat stroke when their truck broke down between the Nigerien cities of Agadez and Dirkou. The UN had saved at least 600 migrants between April and June. “Saving lives in the desert is becoming more urgent than ever,” said Giuseppe Loprete, the Niger Chief of Mission for the International Organisation for Migration. To prevent migrants from reaching the Mediterranean, France has asked five African countries (Burkina Faso, Chad, Mali, Mauritania and Niger) to join its G5 Sahel Initiative. The Sahel is the belt that runs across Africa below the Sahara Desert. The European Union has also contributed to this project. The Europeans want to move their southern border from the northern edge of the Mediterranean Sea to the southern rim of the Sahara Desert. French military bases run across the Sahel, as the United States builds an enormous base in Agadez (Niger) from where it will fly drones to provide aerial support. The military has arrived in the Sahel to stop the flow of migrants. Agadez, where the United States military is spending $100 million to build its drone base, sits at the crossroads of our contemporary crises. Refugees come to it in desperation, their land made miserable by trade policies that discriminate against small farmers and by desertification caused by carbon capitalism. As the United States government has made it difficult for cocaine to enter the U.S. from Central America, the cocaine mafia have moved its operations to this central belt of Africa. A leading politician in Niger, Cherif Ould Abidine, who died in 2016 was known as Mr. Cocaine. Billions of dollars of cocaine now moves through the Sahel into the Sahara and upwards to Europe. The pickup trucks that carry refugees and cocaine go past the town of Arlit, where French multinational corporations are harvesting uranium (Oxfam noted in 2013, ‘One of every three light bulbs in France is lit, thanks to Nigerien uranium’). So here we have it: refugees, cocaine, uranium and a massive military enterprise. Men from Gambia and from Mali wait outside a smugglers’ compound. His Toyota Hilux, the camel of this new trade, sits near the gate. The men are wearing sunglasses. This is their defence once they enter the desert. They are apprehensive. Their future, however grim, must be better than their present. These are gamblers. They are willing to take the chance. The engine fires up. They throw their modest belonging onto the truck. It is time for their azalai.